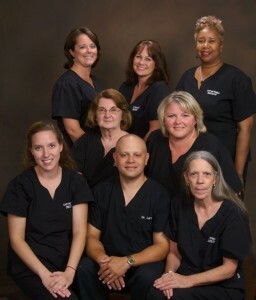 The hygiene team primarily works in helping you take care of your dental hygiene in our office. We have a very knowledgeable team that stays very involved in giving you the basic information and education necessary to help you maintain a beautiful and healthy smile. Our Hygienists are Amanda and Kristi. Our assisting team works chairside with Dr. Carter and they make things easier for both him and our patients. Our assistants are Donna and Jean. They also take care of a lot of in-house lab work. Primarily, our front desk team are the experts when it comes to financial options, insurance and scheduling appointments. They are very efficient when it comes to taking care of your questions, answering your phone calls and greeting you when you come into our office. Our front desk team includes Terri and Barbara.